US electric car manufacturer Tesla plans to raise $1.5bn (£1.15bn) to fund production of its new Model 3 car. Tesla will raise the money by selling bonds to professional investors, despite the company having $3bn in cash. The company says it has 518,000 orders for its new car, whose price starts at $35,000. Initial production of the Model 3 started in July, with a target of 400,000 to be made next year. Tesla, which also makes batteries and solar panels, has been burning through its cash at a rapid rate. The company's founder and boss, Elon Musk, said at the vehicle's formal launch in July that making the Model 3 would lead to "six months of manufacturing hell", as it tries to make 100,000 of the cars this year at its California factory. Some observers have predicted that the company, which has yet to make a profit, will use up at least $2bn this year, hence the need for more cash. The Tesla bonds will have to be repaid to investors in eight years but the interest rate on offer to investors has not yet been decided. Tesla has $3bn in its cash pile, but it is easy to see why it wants more. 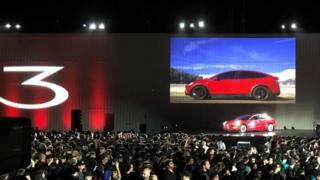 The company has already proved that it can build high-performance, long-range electric cars. The Model S and Model X have an enthusiastic following. Now it has begun delivering its new, more basic and more affordable Model 3. But building luxury premium cars for a small, wealthy and enthusiastic market is one thing. Becoming a viable, mass-market manufacturer is quite another - especially when the mass market for electric cars does not actually exist yet. Tesla built just under 84,000 cars last year and it hopes to be producing 520,000 annually by 2018. That is a huge step forward, particularly for a company which saw production in the first half of this year slowed because of a shortage of batteries. Tesla is throwing money at the problem, and is expected to burn through $2bn this year. But why is Tesla being so ambitious? Why not build up production more slowly? Well, the electric car market is about to get a lot more crowded. Major manufacturers such as VW, Mercedes and Jaguar Land Rover all have high performance electric vehicles in the pipeline, while Renault-Nissan already dominates the more affordable end of the market. Tesla's brand has a Silicon Valley cachet that other manufacturers cannot match, for the moment. But if it is to become a high-volume manufacturer, it needs to use that cachet to build its market share - or risk being sidelined when the more established auto giants roll out their new models.